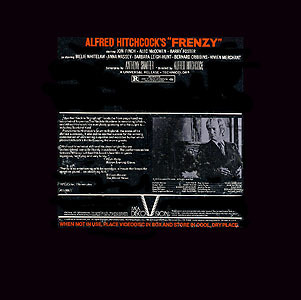 An interesting entry in the Alfred Hitchcock DiscoVision library, Frenzy's climax is somewhat unsettling for many DiscoVision collectors. Most collectors consider Frenzy to have two "dead sides" as side 5 is the infamous disc that won't play. When the disc was mastered, each of the 31,869 frames on side 5 is encoded with an automatic picture stop code, rendering it unplayable on nearly all LaserDisc players. Pioneer's VP-1000, VP-1000A, PR-7820 & LD-660 as well as Magnavox 8000 & 8005 players will play the disc properly because they to not recognize the picture stop code. Some Pioneer LaserDisc players manufactured during 1994 & 1995 have a feature called PSC ON which disables the Auto Picture Stop codes. Also, industrial units which doesn't recognize the code will also play Side 5. Please see the Compatible DiscoVision Player Guide for full details on which players can play this disc correctly. This oddity aside, the replication was still average. 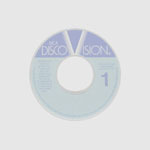 The opening DiscoVision bumper is coded with frame 0 at the beginning. This allows all laserdisc players to see the entire opening graphics. On side 3, frames 28,822 through 28,842 show a framing error which shows the door frame being formed as the camera passes through it. Sides 2-5 utilize the red bumpers. Side 4 encodes frame 0 about 20 frames prior to the end of the test pattern, so it is visible during normal startup on players which search for 0. Sides 2 & 5 have frame numbers that stop as soon as the side is over. Normally, DiscoVision ran the frame numbers several hundred frames into the closing bumper before marking end of side. The Video transfer is well done but does loose a bit of detail in the dark scenes. Audio is about normal for DiscoVision, with dialog clear and easy to understand. However, there are obvious changes in the quality and volume from reel to reel. This indicates that during mastering, they were adjusting the levels one reel at a time. Frenzy last appeared in the DiscoVision catalog in October 1980. MCA Home Video released a new version of Frenzy in March 1989 as a 2 sided CLV disc (Catalog #: 11006).